Happy Sunday! I hope you're still having fun with all the posts at Kate and Jo and Gae's blogs! We're at our halfway point of this summer and a perfect time to reflect and plan forward. Last week I talked about the importance of making time to write and also making sure our students have dedicated time to write. Okay, but then there's thing that happens to me. I sit down, ready to write, and I get stuck. Either I'm not sure what I'm writing about or I know something needs to happen but I'm not sure what exactly needs to happen. Or sometimes I have an idea but it doesn't feel good enough. Even if it's never happened to you, I'm guessing you've definitely had at least one student in your teaching life who just isn't sure what to write. This week's writer teacher advice is all about helping students find ideas and celebrate their ideas. AND it's super simple. Or if it's nonfiction, you can say, "You have to write that down!" Whether it's how they describe something, words they use, something that happened to them, something they noticed, help them see that they need to write it down. Isn't that simple? It's one easy thing you can get in the habit of doing that will make a big difference in how kids see themselves as writers. You can do this for yourself too. Pay attention a little more closely to things that happen as you go about your day and make note of them and how they can fit into your writing. Up on the hill, where the grass meets the cement, I spotted a boy. He was probably 12 or so, sitting there on his phone. I've already had an idea for a novel that I'm drafting this summer but I realized how I could write a scene with one of my characters sitting in this same spot. It seemed like a cozy spot but it also seemed like a lonely spot. I started wondering so much about this boy and then when I drove by it again, I stopped my car so I could get out and take a picture. This easily could have been something I missed or something I saw but didn't latch onto. Except, because I've gotten into the habit of noticing things and telling myself there's a story there, it stuck with me. You can do it too! And believe me, there is power in doing this for our students. So often they don't realize how to connect real life with what we write about and if that's happens, we can help! Here's another example that happened with my son at Nerdcamp. He made a zine and was sharing it with people. When he showed it to Franki Sibberson, she asked him if he would make a YouTube tutorial to show her students how to make it. Of course he said yes and we worked on the video this week. I'm not sure I would have suggested he do this and I'm not sure he would have either! But with a little nudge of inspiration, he did it! This week did you spot any stories or can you think of any now that you have to go and write down? Be sure you do...because that's a story! I can't wait to hear how everything is going! Happy writing!!! What did your writing routine or habits look like this week? P.S. Thank you for replying to each other's comments! reply as soon as possible, it doesn't always happen. I so appreciate you cheering each other on through Teachers Write! Keep being awesome! Jen, thanks for posting and I love the You tube video. So cool. Definitely going to do that with my library kids. You’re right in we can find little snippets of things that can add to a scene. 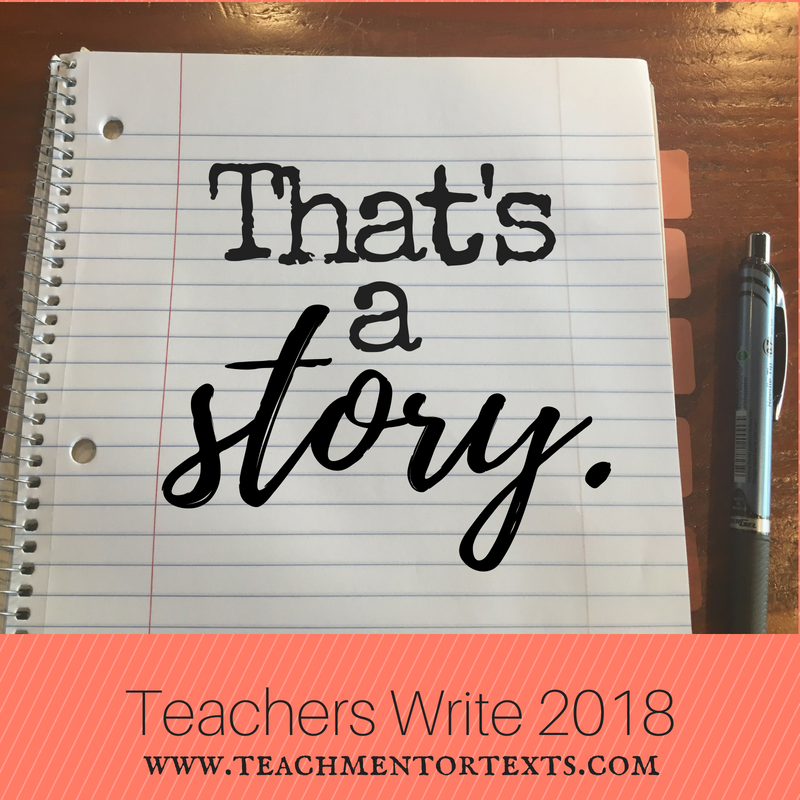 I learned some interesting things concerning this in our posts this week on Teachers Write. Things from using our senses and cutting out words that create distance. And now your post about those things that come in our daily life and world. We have more to work with than we think. Most of the writing I did this week, was research for my new YA novel. It was a lot of fun. I hope to finish up some minor character sketches this week and then officially begin. Hope you have a great week as well as others who stop by. Thank you so much for this post. I am doing a workshop with kids this week around my new book and we are definitely making a zine!!! Also in answering your question about seeing what you want to write about, I have two comments: 1. My students write a slice of life every week, so anytime they tell me stuff, I say, "Sounds like a slice." Once last year I had a bee in my hair. When I grabbed it, it stung me and I said a bad word. I immediately apologized but left the room to get ice. When I came back, guess what my kids were doing? Typing like mad to see who could post the story faster. Yes, anything can become a writing prompt. And 2) I met the photographer from my book at our book signing event last weekend and he brought me a card with more photographs of wetlands, so I am primed for book 2. I have to write the poems, but I love having the next project ready and waiting. I'm sure your encounter with the boy and the setting led to some vivid writing. Have a great week! 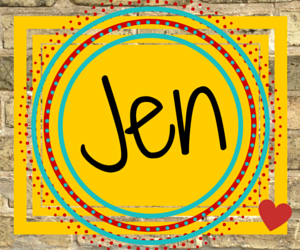 I can tell from your stories that you develop a community of writers and that is so cool. Bravo to you. And hooray for your next book! Love it! Loved the video. So beneficial for other students to see kids their age creating. This week was filled with poetry writing and research. I've been on an emotional roller coaster since the end of May with my mother being extremely ill. She had asked me to go through things and sort them so I have thing organized for when she is gone. Poetry helped me with those emotional days. Coming across pictures of my parents and their parents, some when they were in school or doing other activities had me taking down "I wonder" notes. However, it was a statement made by a parent of one of my former students that gave me the coolest idea. Her daughter was preparing to go to 4-H camp. Her mom wrote that her daughter was "vibrating with excitement". That phrase stuck with me all day. I wondered what makes each of us vibrate with excitement. I have written it down as a writing question for my students this year as well as the teachers in my department. I am hoping that this next week will more sedate and I will be able to focus on revisions of my current story. Ooooo! It sounds like that mom had something she could have written down! 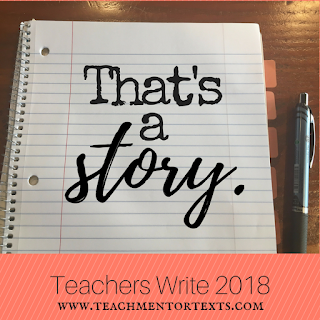 I love that it has stuck with you and now might influence your writing and your student's writing. Even little phrases like this make such a difference. Today my older son told my mom he played bowling with someone and it made me smile. I love paying attention to words or phrases people use and what it tells a person about them. I find writing to be helpful to me when I'm processing my thoughts, and especially emotions that goes with those thoughts. I'm sure it must be difficult but I think it's great that you're capturing memories and using writing to help you. Best of luck with your revisions! Wow, I love that idea of helping kids see their every day stories. It's also useful for if you don't have time to hear the whole thing right that moment, but really do want to hear it! Hehe. I didn't have time to come answer the check-in yesterday, but I still wanted to stop back. I wanted to let you know I tried your idea of writing about my son this week! It helped me to be able to answer more of the prompts this week (though I'm sure I missed something still), and it was fun. At the same time, he's started telling his own stories and asking me to write them down or record him on video. They. Are. So. Cute. I never knew I'd love a 2-year-old's stories so much. It probably has something to do with the way he says "Once upon a time," haha. Oops, apparently forgot to attach my name to that comment. Here we go. 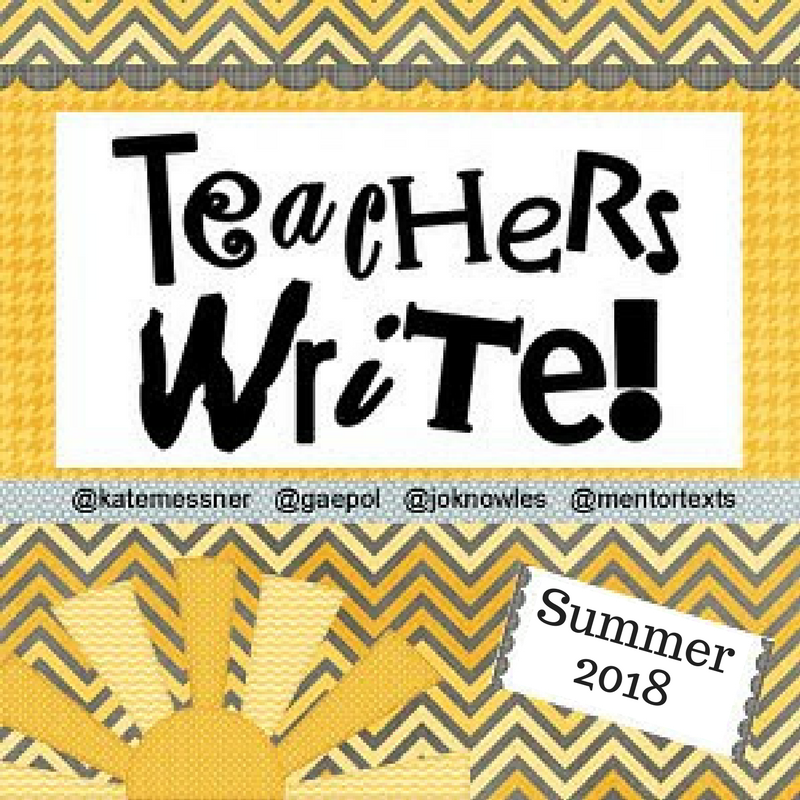 Kicking Off Teachers Write 2018!